A self portrait from life. The Artist Naj lives in Norfolk, UK. Her art work has sold both nationally and internationally. Her ability to reproduce or copy, together with her technical ability has meant that she has had a wide range of custom art commissions over the years. Commissions for portraits and animal portraits in artists pastels have had the greatest demand, and Naj has some twenty years experience in the field of portraiture. She has also had work as diverse as sign writing commissions for hand painted and chalkboard signs, canal folk art and caricatures! Naj is a flexible, multi-skilled artist who enjoys an artistic challenge and is prepared to try her hand at many things creative. 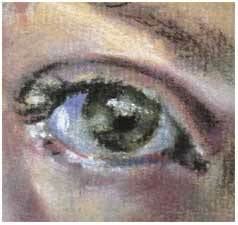 This has meant that, with the exception of portraits, she has not specialised in any one area. Working mainly to commission, means she owns very few pieces of her own artwork and therefore rarely exhibits. Why the name Naj? As much of her artwork was initialled Naj, Naj became adopted as the artist name. In 2005, Naj completed an online nationally accredited telematics course. This gave her firm foundations in the basics of webpage design which she has been able to build upon and bring you this web site. She has compiled a list of links to useful web design resources for like-minded enthusiasts. She also rambles on about web design issues in her blog, My Depictions. Naj won the Coxsoft Art Silver Surfer Friendly Award in 2007 for her work in writing, building and designing this site, making Mydepictions - Original Art by Naj an award winning web site! In 2009 Naj developed an interest for building Google Gadgets, sometimes called mini applications or Google modules. Becoming a Google gadget developer has enabled Naj to work with different combinations of code and scripts, expanding her web development knowledge and interests further. You can view a list of gadgets published to the Google gadget directory on Naj's iGoogle Developer Page. An ACEO art card by Naj. In 2005 Naj decided she would explore selling her artwork on the internet, which led to an involvement in the Artist Card Editions and Originals (A.C.E.O.s) movement. A.C.E.O.s, known as Artist Trading Cards (A.T.C.s) when traded between artists, are miniature highly affordable works of art measuring 2.5 x 3.5 inches. For Naj, ACEOs have provided a way of selling promotional samples of art to an international audience. 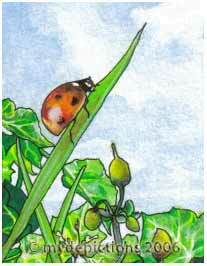 You can see examples of past ACEOs on the art listings gallery page. ACEO art cards by Naj can currently be purchased via Depictions etsy store. Naj has temporaily retired from selling ACEOs at auction, however you are welcome to visit Naj's art auctions should she resume selling at auction.